Today happens to be the 16th anniversary of my kidney disease! Sixteen years back, on this day, I took those vaccinations which triggered Atypical Hemolytic Uremic Syndrome due to the genetic mutation that I did not know I had. Incidentally, on this day, I am sharing some really good news with you! There is a global initiative currently underway to promote home hemodialysis. A forum consisting of experts on home hemodialysis from around the world has been formed. The end goal is to prepare a practice manual for dialysis centers who want to offer home hemodialysis to their patients. Dori Schatell of the Medical Education Institute, USA, who has done some phenomenal work in Home Hemodialysis among other things asked me one day if I would like to be a part of this group and I instantly agreed. I sent her my 'resume' - the first I prepared for this kind of work and voila, I was selected! I have been a part of a sub-panel and we have been working on our section of the manual for a few months now. The forum meets in Chicago on the 25th of this month and I will be going too! I will get to meet some very reputed nephrologists during the meeting. I will also get to meet Dori herself for the first time! After the meeting I am planning to spend a few days in California with some friends and then return. I am really thrilled about this whole thing! I will be able to contribute to a cause that has been so close to my heart. 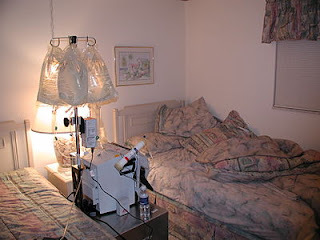 Truly, nocturnal home hemodialysis has been a life-changer for me. It has been my life's turning point. Everything I am today is due to this amazing modality. Finally, I will be able to do something concrete to bring this modality to more people. As part of this group, I can actually make a difference. I would be very keen to see how this pans out in the Indian context as well. When even basic dialysis is out of reach for a vast majority of people who need it, things as fancy as daily home hemo can only remain a pipe dream. Hopefully, through this forum, we can find ways to make a small difference in developing countries such as India as well. Soon enough. Congratulations Kamal for being nominated to share the desk on such a global level. Truly, your family, your resources and especially the passion in YOU achieved this. Congratulations!! Your positive spirit is inspiration to many people. Love your enthusiasm! You are an inspiration to remind us how every one has to learn to be grateful for their lives! Congratulations! hi can you guide me for the hemodialysis procedure along with the cost and the method to be used. i will be very thankful to you u can send me email on Shobha_05leo@yahoo.co.in. I feel u can help out people in india by sharing your views on this.